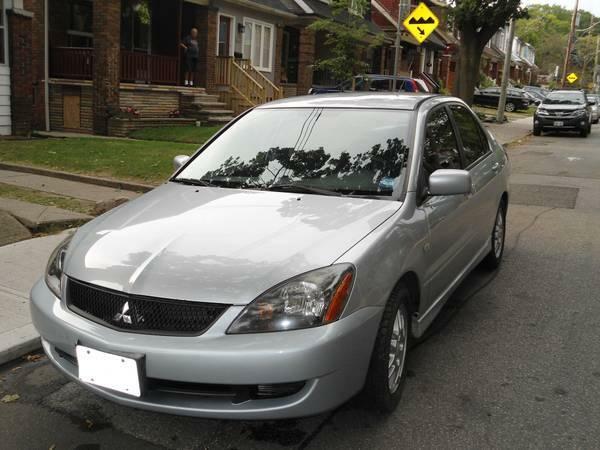 I am selling my xxxx Lancer OZ-Rally Edition. It has passed a safety inspection and an emissions test. CarProof report available upon request. This is a great car, the body kit gives it a sporty look, the 5-speed manual transmission is fun to drive, it's great on gas (~ 8L/100km), and it has never been smoked in. The only reason I'm selling it is I'm moving to England. The car has had regular servicing, and oil changes done every xxxx km. The front brakes are brand new (done for safety), the battery is also new (it has another 28 months of replacement warranty). The car has alloy wheels with Goodyear Eagle GT performance tires and it also comes with a set of 4 Pirelli winter tires on steel rims. If you have any questions, or would like a test drive, please feel free to contact me.